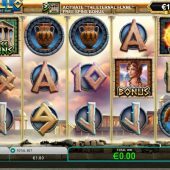 Apollo God of the Sun slot has a Roman theme as you would expect and features the Muse and helmets and of course the Colosseum on the reels. The game has 20 pay lines and comes in the usual 5-reel 3-row format. Sword-slashing and dramatic music makes the soundtrack with the Legionnaire standing guard on the left of the reels, styled like the front of a classic temple. The Sun itself appears on the reels as a non-multiplying Wild paying 25x stake for 5-of-a-kind as does the top-paying symbol the Legionnaire himself. The lowest chiselled-from-stone card symbol pays 2.5x stake for 5. There is a random in-play feature 'The Almighty Sun' whereby the God Apollo will beam down his light and make 2 reels Wild on any spin. There are 2 bonus rounds available. Firstly the Muse appearing on reels 2, 3 and 4 will award a pick-me feature where you select musical instruments for cash prizes. The maximum is on 45x stake for round so a gentle prize from the gentle theme of this feature. Really we need something with a bit more aggression, more befitting a soldier. Do we get it? If the Colosseum scatter appears on reels 1, 3 and 5 then yes you do! This triggers the 'Eternal Flame' 7 free games in which the 'Almighty Sun' feature occurs every spin thus guaranteeing you any 2 reels Wild for each. The game also guarantees you will get a win each spin too so although there is no retrigger this round can be quite lucrative. There is also a large Progressive Jackpot that can be randomly triggered on any spin although higher stakes make it more likely, typical of Progressives. 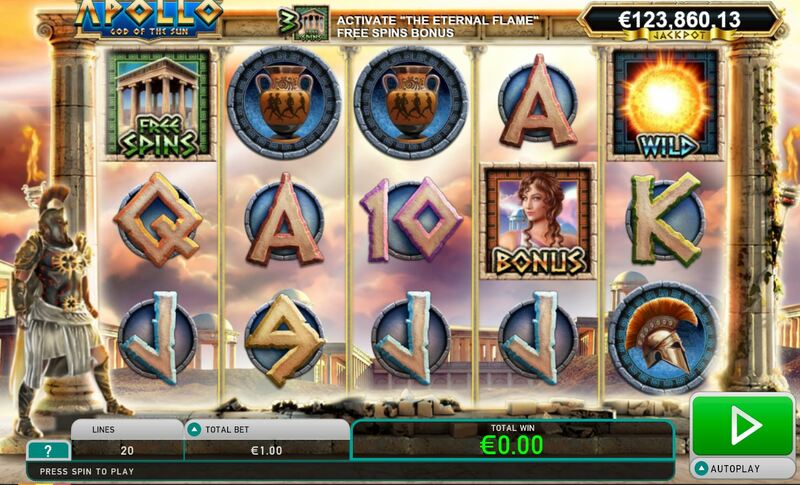 Apollo God of the Sun slot is fun to play and has a high RTP of 97.17% although 3% of that figure is for the Progressive so in reality you get 94.17%. The pays are decent too so when the random in-play feature occurs it can be rewarding. The free games are usually quite good and the soundtrack doesn't wear you down along with the decent graphics that for once aren't from a toddler's first book. Other games in this genre that you may also enjoy are RTG's Caesar's Empire, WMS' Rome and Egypt and possibly Roman Chariots, also from WMS.